I am asking myself these questions for so many times... Why do I love him despite all those negative things I heard about him... Why does my heart beats for him? I have been interrogated by my heart and my mind because even them cannot get the right answer. Corny? Hmmm... I really do not care how will you take it but I am just trying to express how I truly felt about him. We do not have that perfect relationship, what we have is pure love and contentment with each other. 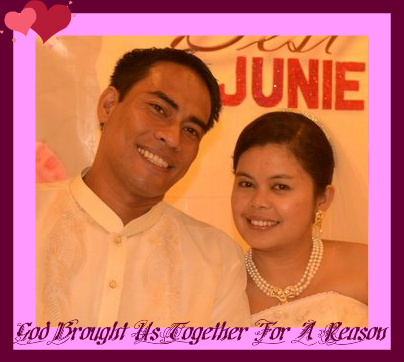 We are both positive that God brought us together for a reason. Whatever is that reason, I am glad and will always be. I grew up with the belief that men were born to frustrate women (that's the impression that my father left in my heart). I have so many frustrations, I have so many doubts, I have so many questions- but I realized that these are the proofs that my heart really beats for him..Why? because without those feelings, I am completely unmindful of this relationship, but I'm not. I tried to be numb but I just cannot deny it nor I can deceive myself... Corny again? but that is just the truth. That certain things I have mentioned remains unshaken... in fact, by the will of God- we made it... We both took the vow to spend our lives together for the rest of our lives on April 28, 2011. To you my Huggy, I am so proud to say that I never regret the day I said I DO. I love you sooooooooooooo much! I blessed the day you were born... Because on that day, God started to write our love story. Awww... how sweet.... Hi Jack... was here for PF... hope you can visit back! hello Ms Verns... thank you... hmmwah! wow, so sweet of you... nice post! here's wishing u more love and more years to come and blessings for the coming baby, too. KAkilig naman! :) Sooo inlove!